Owner Terry Schumacher originally confused Yoda for a rat. It’s not hard to see why. It may not be the world’s greatest honour, but when you look like 14-year-old Yoda, you have to take what you can get. 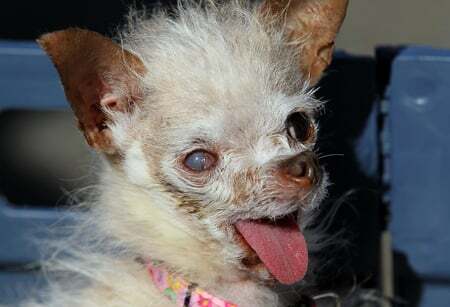 The Chinese crested-Chihuahua, with her scruffy short tufts of hair, protruding tongue and bulbous, bloodshot eyes, took out this year’s World’s Ugliest Dog Competition. With it came a cheque for US$1000 (B30,000), a trophy, and lots of pet perks after stealing the hearts of judges and the audience alike with her ‘unique’ appearance. Owner Terry Schumacher of Hanford, California, said when she first encountered the pooch, she was convinced that the animal was a rat. After realising that the ball of hair and limbs was actually a dog, Ms Schumacher took the animal home and named her new pet after the pint-sized Jedi master from the Star Wars films, to whom the dog bears a resemblance. Yoda has since become part of the Schumacher family. She eats the same food as the Schumachers, and often accompanies Ms Schumacher to her day job as a dog groomer. At the contest, held at Sonoma-Marin Fair in California, Miss Schumacher hugged and kissed Yoda after she won the title as a first-time entrant in the 23-year-old show. A variety of other dogs, some missing eyes, fur, and others limping on limbs of a variety of sizes, also strutted their stuff at the World’s Ugliest Dog Contest. The goal of the contest was to raise awareness of rescued dogs and to encourage adoption. Many dogs at the contest were bred unsuccessfully and then abandoned at animal shelters when their owners discovered that they had uneven legs, crooked spines and other deformities. Other competitors included last year’s winner, Princess Abby, a one-eyed Chihuahua, and a blind 15-year-old pug called Hercules.